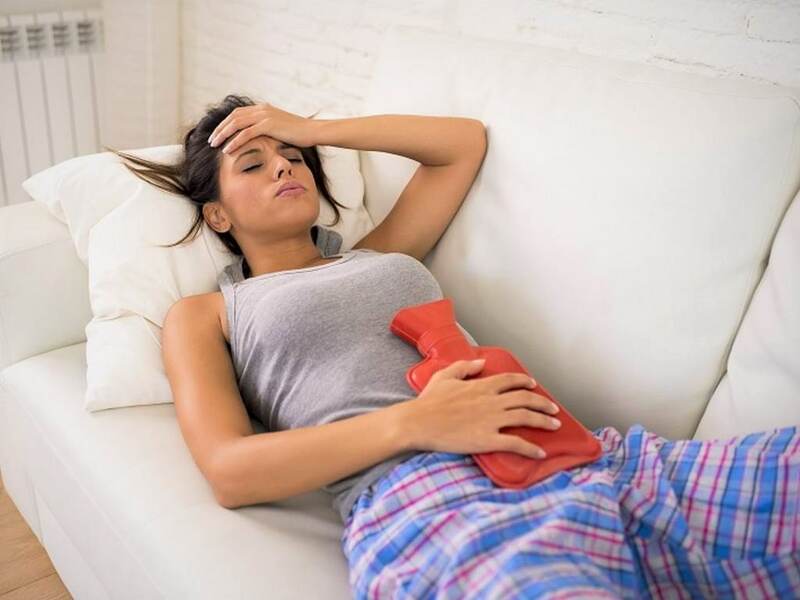 Painful Periods or Menstrual cramps also known as Dysmenorrhea, is pain during menstruation. Its usual onset occurs around the time that menstruation begins. Symptoms typically last less than three days. The pain is usually in the pelvis or lower abdomen. Other symptoms may include back pain, diarrhea, or nausea. Period pain is estimated to occur in 20% to 90% of women of reproductive age. It is the most common menstrual disorder. Typically it starts within a year of the first menstrual period. When there is no underlying cause often the pain improves with age or after childbirth. In young women painful periods often occur without an underlying problem. In older women it is more often due to an underlying issues such as uterine fibroids, adenomyosis, or endometriosis. 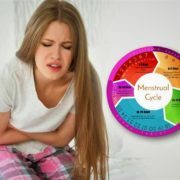 It is more common among those with heavy periods, irregular periods, whose periods started before twelve years of age, or who have a low body weight. Period pain occurs less often in women who exercise regularly and those who have children early in life. Dysmenorrhoea may be either primary or secondary. Primary Dysmenorrhoea. This happens when you first start your period and continues throughout your life. It is usually life-long. It can cause severe and frequent menstrual cramping due to severe and abnormal uterine contractions. Secondary dysmenorrhoea. This type is due to some physical cause. It usually starts later in life. It may be caused by another medical condition. This includes pelvic inflammatory disease or endometriosis. Women with primary dysmenorrhoea have abnormal contractions of the uterus due to a chemical imbalance in the body. For example, the chemical prostaglandin that controls the contractions of the uterus. Secondary dysmenorrhoea is caused by other medical conditions, most often endometriosis. This is a condition in which endometrial tissue implants outside the uterus. Endometriosis often causes internal bleeding, infection, and pelvic pain. The symptoms of period pain may look like other conditions or medical problems. Always talk your gynecologist for a diagnosis. What are the risk factors for period pain? Women who drink alcohol during their period (alcohol tends to prolong menstrual pain). Women who started their periods before the age of 11. Women who have never been pregnant. See your gynecologist if you have severe period pain or your normal pattern of periods changes – for example, if your periods become heavier than usual or irregular. If your period pain hasn’t been controlled after three months of treatment with painkillers or the combined contraceptive pill, you should consult the gynecologist. You should also see your gynecologist if you have symptoms of secondary dysmenorrhoea, such as intense pain or heavy or painful period. How is period pain diagnosed? Laparoscopy. This minor procedure uses a laparoscope. This is a thin tube with a lens and a light. It is inserted into an incision in the abdominal wall. Using the laparoscope to see into the pelvic and abdomen area, the healthcare provider can often find abnormal growths. Cause of the condition (primary or secondary). Your tolerance for specific medicines, procedures, or therapies. Prostaglandin inhibitors, such as nonsteroidal anti-inflammatory medicines, or NSAIDs, such as aspirin and ibuprofen (to reduce pain). Diet changes (to increase protein and decrease sugar and caffeine intake). Endometrial ablation (a procedure to destroy the lining of the uterus). Hysterectomy ( the surgical removal of the uterus). Stopping smoking – smoking is thought to increase the risk of period pain. Warm bath or shower – taking a warm bath or shower can relieve pain and help you relax. Heating pad – putting a heat pad or hot water bottle (wrapped in a tea towel) on your tummy may help reduce pain. Abdominal Massage – light, circular massage around your lower abdomen may also help reduce pain. Exercise – you may not feel like exercising during a painful period, but keeping active can reduce pain; try some gentle swimming, walking or cycling. Relaxation techniques – relaxing activities, such as yoga or pilates, may help distract you from feelings of pain and discomfort. Transcutaneous electronic nerve stimulation (TENS) – a small battery-operated device that delivers a mild electrical current to your tummy, which can help reduce pain. Dietary, vitamin, and herbal treatments — A variety of dietary and vitamin therapies have been studied for the relief of dysmenorrhea. 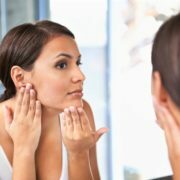 However, the studies involved a small number of women and do not provide sufficient data regarding safety or efficacy. While a review of published studies suggested that ginger powder could have some effect, however we do not advise dietary, vitamin, or herbal remedies for dysmenorrhea. Period pain is characterized by severe and frequent menstrual cramps and pain during your period. Period pain may be primary, existing from the beginning of periods, or secondary, due to an underlying condition.